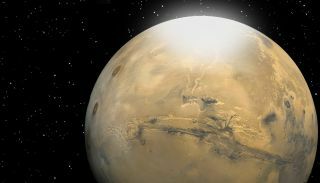 Researchers have calculated that carbon dioxide snow particles on Mars are roughly the size of a human red blood cell. Martian snow is depicted in this artist's rendering as a mist or fog that eventually settles to the surface. Snowflakes on Mars are smaller than their Earth counterparts, having roughly the same diameter as a human red blood cell, a new study reports. Researchers analyzed observations made by two Mars-orbiting spacecraft to calculate the size of snowflakes on the Red Planet, which are composed of carbon dioxide rather than water. "These are very fine particles, not big flakes," study co-author Kerri Cahoy, of the Massachusetts Institute of Technology in Cambridge, said in a statement. An astronaut standing among snow particles falling onto the Martian surface "would probably see it as a fog, because they’re so small," Cahoy added. Clouds of snowhang above Mars during the planet's winter, covering its poles and reaching about halfway to the equator. The researchers studied observations of these clouds made over the last decade or so by two NASA spacecraft, the Mars Global Surveyor (MGS) and the Mars Reconnaissance Orbiter (MRO). Occasionally, the laser beam returned faster than anticipated, after ricocheting off cloud particles in the Martian atmosphere. By analyzing how much light these clouds reflected, the researchers were able to calculate the density of carbon dioxide in each one. They figured out the total mass of snow particles hovering above Mars' poles by examining earlier measurements of tiny, seasonal shifts in the planet's gravitational field. The team put all of this information together to calculate the number and size of individual snow particles in the polar clouds at various times. The scientists found that particle size differed from pole to pole, with flakes in the north measuring between 8 to 22 microns and those in the south just 4 to 13 microns. Both of these size ranges are microscopic, about comparable to the width of a human red blood cell, the researches said. “For the first time, using only spacecraft data, we really revealed this phenomenon on Mars," said lead author Renyu Hu, a grad student at MIT. The results of the study will be published in an upcoming issue of the Journal of Geophysical Research. Snowflakes require a kernel of some sort around which to form — a speck of dust, for example. So knowing the size of Martian snowflakes may help researchers better understand the properties and behavior of dust in the Red Planet's atmosphere, Hu said. "What kinds of dust do you need to have this kind of condensation?" he said. "Do you need tiny dust particles? Do you need a water coating around that dust to facilitate cloud formation?" Further, Martian snow may affect how heat is distributed around Mars, reflecting sunlight in various ways depending on the size of each particle. "They could be completely different in their contribution to the energy budget of the planet," Hu says. “These datasets could be used to study many problems." Follow SPACE.com on Twitter@Spacedotcom. We're also on Facebook and Google+.